If we look at problem-solving as “figuring out something truly novel” as opposed to “grinding out an answer using different insertions for the variables”, the game gets much more complicated… and there’s a lot more to ‘teach’ and to discover. I’ve posted a number of different “derived wisdoms” elsewhere (Polya, me, thinkBio’s problem-solving games directory), now I want to highlight a specific example about a general principle: “The way represent a problem defines the answers we can come up with.” Take the famous figure on the right. 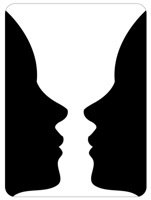 If presented as “Look at the black images; what do you see?” most come up with a pair of faces. If asked “What is depicted in white?” you see the goblet. The derived challenges are: how do we make sure we cast problems correctly? and how do you ‘unsee’ an initial finding? The other day, walking around barefoot in the master bath, as I got close to the window, the floor suddenly felt quite warm. The window faces West, so my brain handed me “yo, that’s where the sun is!” So I turned all my thinking to deposition of heat… could light come in the window and heat the floor, which retains it? Could that section of floor be over the porch, where insulation is not as good? Could this be a recent addition that’s simply insulated more poorly? Last night, I resolved to check more carefully. I checked as prior to air conditioning… no real difference. I later randomly went into the guest bathroom and noticed how COLD the floor was… no doubt the outcome of air-conditioning ducts in the ceiling that blow toward the floor. But this was a new realization—maybe the coldness of the floor was the ‘active’ result; the ‘background’ starting condition in the master bath had not been mild-that-became-warmer but warm-with-generalized-cooling. So my new hypotheses are 100% different: instead of focusing on the RETENTION of heat from a hot day, I am now looking at the acquisition of coolness from a vent high overhead… that can plausibly be seen as ‘pointing at’ the central part of the master bath, while missing the region that caught my attention the first time. The central fact is that the framing of the question (“Why is this part of the floor hotter?” vs. “Why is most of the floor cooler, but not this spot?”) is a wonderful example of restricting inquiry. It suggests a problem-solving rule, such as“Re-state your observations in as many variant ways as possible”). If you’re familiar with PatternMaster, you see it in the “is the pattern about a clockwise neighbor making ME happy, or am I making IT happy?). It’s interesting to note that the layout of the master bedroom essentially drove my thinking. Since I walked FROM the cold floor to the warm area. So my brain’s default presentation was “the cool floor is the norm; what is this new WARM change?”. So my entire focus was “causes of excessive warmness”. The next night, I noticed the cool floor in the absolute, but it was ‘so cool’ that my brain told me that the floor “had been cooled a lot”, so I thought of COLD as the “aberrant state”. Bottom line: when helping students develop their problem solving toolkit, consider whether “explore multiple phrasings/sketches/castings of the problem as part of the quest for solutions.